Black and white photograph with ball point pen noting Graining Department at the Boston Mat Leather Company, Peabody, Massachusetts, 1918. Five men are in the photo, four to the viewer's right before a long table on which lie completed hides. To the left in another man holding a hide, next to a wooden horse on which are more hides. In the back are hides hanging up. The man on the right, closest to the camera must have moved as his head and arm are blurred. 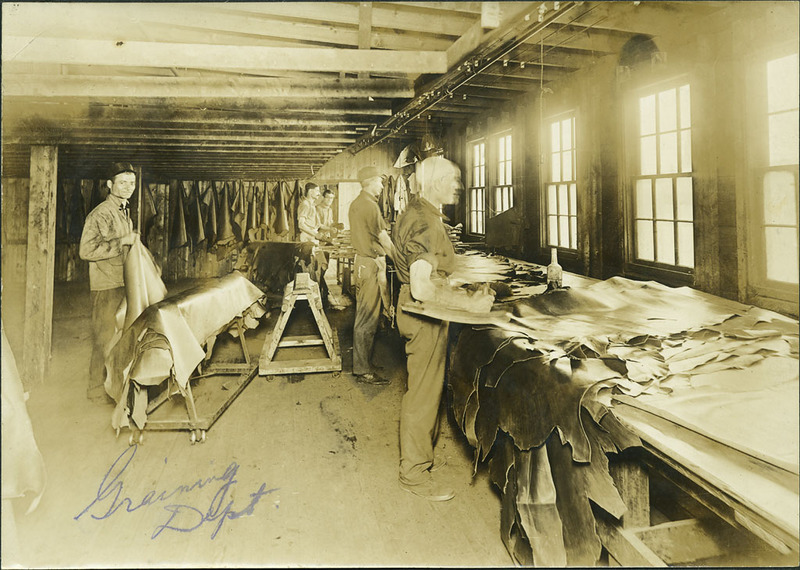 “Graining Department,” Peabody Institute Library, Peabody, Mass., accessed April 18, 2019, https://digitalheritage.noblenet.org/peabody/items/show/176.